We've been waiting for a big time from Green Hope (aka Western Cary TC) all season. They've run low 8 minutes and a few sub 8 marks in what were clearly not an all out effort throughout the season dominating their competition. They clocked 7:41.43 taking down New Bern's 10 year old state record (2008) of 1:46.80. Delgado tried to real in Loudoun Valley on the anchor leg running the fastest split of the race of 1:50.43. But Loudoun's lead was too much to make up as they ran . 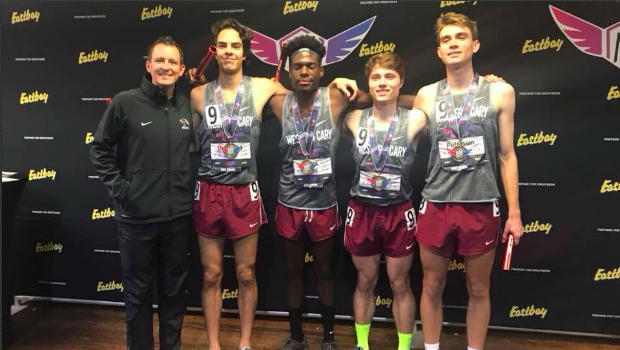 US#2 All-Time Indoors 7:39.30 to Green Hope's US#5 All-Time Indoors 7:41.43. Delgado was able to return from his 1:50 split to run an open PR of 1:51.06, which is just off Karjuan Williams' (New Bern) state record from 2006 of 1:50.68. It'll go down as NC#2 All-Time Indoors and the 12th fastest in state history overall. Can Delgado take down John Crossley's (West Carteret) Outdoor State Record of 1:48.01 this season? Also in the race taking 8th overall was Weddington who ran NC#4 All-Time Indoors 7:52.74. They return their entire team next season. Green Hope holds the outdoor state record of 7:38.83, set in 2015 with Delgado and Kehn as sophomores. If they can run 7:41.43 indoors, we could see something really special at some point this outdoor season.